DON'T GIVE UP YOUR VOICE! is at first glance about Argentina, but it is also about the USA. Argentina elected its Trump, Mauricio Macri, a year before we elected ours. The two are quite similar in the tone of their campaigns and the policies they are promoting once in office. But Argentines are resilient, and they have fought right wing governments before. DON'T GIVE UP YOUR VOICE! looks at the widespread and creative resistance to Macri's policies--in organized labor, at worker co-ops and street protests, in theater and music. The film offers instructive parallels with the situation in the US, while illustrating the power of collective action. Other films by Mark Dworkin and Melissa Young are Plane Truths, WEconomics: Italy, Shift Change, We Are Not Ghosts, Good Food, Argentina: Hope in Hard Times and Argentina: Turning Around, Net Loss, Another World is Possible, Not for Sale, Gene Blues, Islas Hermanas and Risky Business. "Urgent viewing for all those in the Americas and around the world who are fighting to beat back the threat of far-right and neo-fascist ascendance." "It's terrific. And so timely. It has amazing parallels with the US...Great political analysis and great views of the co-ops. " "The huge and unnecessary human costs of capitalism's cyclical instability and inherent tendency to inequality have always provoked anti-capitalist initiatives. 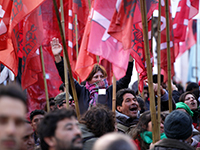 Increasingly, the initiatives focus on the micro level: to transform workplaces' internal organizations from their hierarchical, anti-democratic past into a genuinely democratic worker-cooperative future...This film documents the process in Argentina." "Macri emerged as a Latin Donald Trump, adept at manipulating citizens dissatisfied with the status quo, demonizing the 'Other' and pitting people against one another...The culture of resistance continues strong among the people...They have not given up their voice. They give voice to the resistance to savage capitalism that has enveloped Argentina. La lucha continua." "This film offers a ray of hope in a time of fear brought on by right-wing electoral victories that have unified courts, governments, and media. The solution to such electoral failures? Cooperatives and neighborhoods actively supporting each other in taking over workplaces for self-governance. Newspapers, hotels, drama groups, factories - All Americans need to know the power of collective action and cooperation in the face of such governments. View the film; show the film; discuss the film; and then act for the good of all." "Don't Give Up Your Voice will benefit a range of interdisciplinary audiences - students, educators and community groups - interested in contemporary Argentina or experiencing similar circumstances in their own communities. Few countries capture the intersection of global markets and ideological divisions, on the one hand, and domestic political institutions and civil society, on the other hand. This film articulates and illuminates the multiple venues - the arts, the factory floor, the streets, etc. - in which current struggles, conflicts, and resistance unfold." "How can activists respond when a right-wing populist is elected president? In Argentina, artists, worker coops, and independent media have come up with creative answers. This lively documentary shows they have important lessons for the rest of us." "Dynamic documentary...An on-point introduction to Argentina's current situation...The film centers on how everyday people engage in meaningful and effective acts of resistance in order to protect their jobs, defend their dignity and stand up for a truly democratic society. Nuanced and exploring this moment of struggle from a variety of perspectives, Don't Give Up Your Voice is a powerful depiction of how politics are made by workers, protestors, teachers, community organizers, artists and everyone who cares to be involved." DVD is mostly in Spanish with English subtitles, and includes optional English SDH captions for the deaf and hard-of-hearing, as well as scene selection.